If you want a quick demonstration and then come back to the details, see this example tour which shows the Scots Guards in Europe 1914-1919. I especially like this one as it shows their journey to the Western Front, right from assembling at the Tower of London, through Dover and across the channel, and their first action including – strikingly – a picture of their first casualty. There’s also one as a prisoner of war in Switzerland, and one post-armistice in Germany. It feels like it’s very much intended as a platform for manually crafted, carefully curated stories, but I wondered what if would be like with any old collections data. The free online platform doesn’t have an API but it does have a very simple csv upload facility, so as a quick experiment I wrote a script that would transform an Imperial War Museums (IWM) collections Solr query into the correct format – less than an hours work. 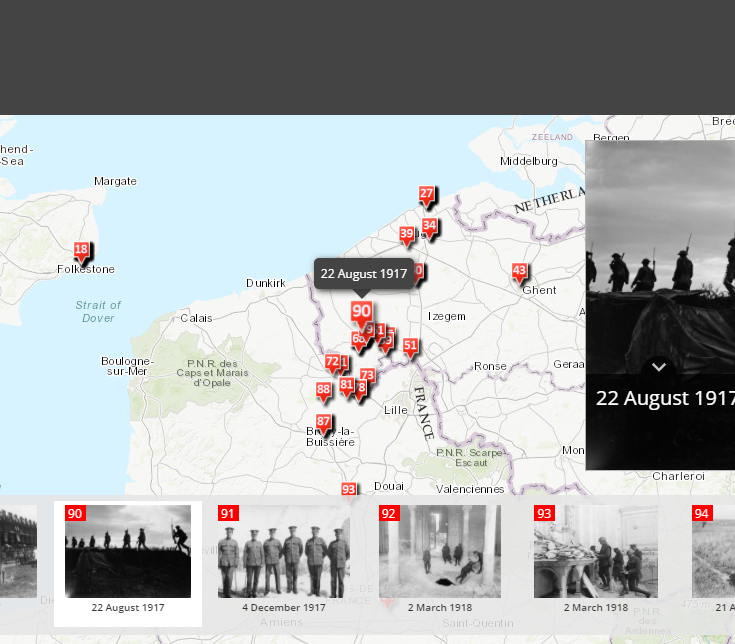 The challenge though is that there are no geotags in the IWM data, just textual placenames, and I although not a requirement I wanted to display the images in chronological order, so that meant dates. The script was therefore extended (with a couple of helper scripts I already had) to gather geotags via the Google Geocoding API for any placenames stored with the object metadata, and to parse the titles and all descriptive text to pick out any dates, no matter what format they were in (well, within reason). Finally, everything was written to a simple database table, primarily to just cache the results. Here are a few test examples trying it out with some different scenarios. It’s worth remembering that these are created pretty much directly out of existing metadata from the collections without any curation beyond formulating the original search query. One of the strengths of doing exports rather than a live API feed is that they can then be editorially tweaked, whether that’s enhanced descriptions, moved placemarkers, or even just to delete erroneous or superfluous markers. titles and descriptions, certainly within the IWM collections, don’t always lend themselves to creating good stories about objects! But I’m equally aware that I haven’t properly explored the capabilities of the software. I’ve only looked at the free online platform, which in itself has so many templates and options to use, and that was back in 2016. A quick glance suggest that with proper development time a lot more could be done. It also supports video, which is exciting. All of this reminds me that I must ‘explore’ Storytmaps further as a platform.